How a Center for Agroecology & Sustainable Food Systems alum helped develop a food community in San Francisco — thanks to a start at UC Santa Cruz. Mark at the UCSC Farm & Garden, 2006. 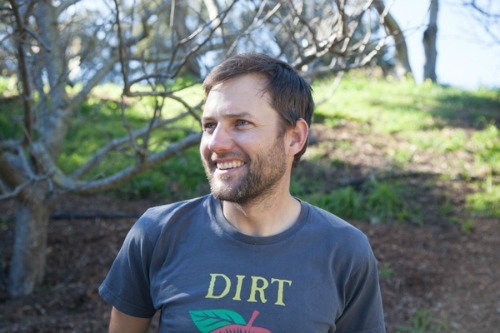 When Jason Mark started gardening at the Page Street Community Garden in San Francisco, little did he know that a few years later he would enroll as an apprentice in the ecological horticulture program at UC Santa Cruz and revive the largest urban farm in San Francisco. Mark picked up gardening after the September 11, 2001 terror attacks, a pivotal event for the recent Georgetown University alum who was working in political communications at the San Francisco-based international human rights organization, Global Exchange. ‘The world came apart at its seams,” Mark recalls. So Mark picked up a digging fork and began growing carrots and lettuce in a 4 x 4 plot at the Page Street Garden. But he had bigger plans. He had learned about the Center for Agroecology and Sustainable Food Systems from Vicken Hillis, a friend from his college days who was an apprentice in the 1999 cohort. “I dreamed of going to the program ever since I visited Vicken at their Up Garden [Alan Chadwick Garden] rotation party back in 1999,” he shares. While Mark was deeply involved in activism and global climate change as the communications director and then campaigner at Global Exchange, he wanted a more tangible interaction with the environment. So in 2005, Mark left his office job to live full-time at the farm at the University of California, Santa Cruz and study ecological horticulture at the Center for Agroecology and Sustainable Food Systems (CASFS), a world renowned program that provides training in the concepts and practices of organic gardening and small-scale farming. The program’s mission resonated with his ambition: to research, develop, and advance sustainable food and agricultural systems that are environmentally sound, economically viable, socially responsible, nonexploitive, and that serve as a foundation for future generations. Over an intense six month period, students take courses in diverse topics including soil management, composting, pest control, crop planning, irrigation, farm equipment, marketing techniques, Community Supported Agriculture (CSA) practices, farm labor issues, food policy, equity and access within the food system. “It was the height of the slow food movement,” says Mark about the year he enrolled. Organic food and sustainable living were hitting mainstream audiences. When Mark was a second year apprentice (akin to a teaching assistant) at the UC Santa Cruz farm, Michael Pollan published The Omnivore’s Dilemma. Walmart had just begun stocking organic produce. Organic and wholesome food was going big. “We were untangling this big knot between ecological, sustainable and healthy foods with access and equity for eaters and social justice for farmers,” says Mark about his studies at CASFS. 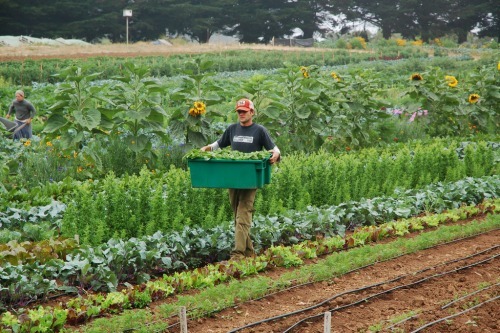 While Mark was at UCSC, he wondered what had happened to San Francisco League of Urban Gardeners (SLUG)’s farm in the wake of the group’s recent organizational problems. He decided to find out. He made a trip up to the city and discovered self-described guerilla gardeners squatting on derelict land. Mark felt an urgent need to revive the farm, a unique 3.5-acre lot adjacent to housing projects and a freeway. The grassroots farming community of Alemany Farms was born. Mark spent most of his second year at UCSC commuting between the two farms, immediately implementing the knowledge he learned as he got the San Francisco urban farm back up and running. He recruited some friends from his CASFS cohort to help prepare big sections of the farm for production, and in 2008 and 2009, he sourced starts from the Santa Cruz’s Homeless Garden Project, a farm managed by another CASFS alum and friend of Mark’s, Paul Glowaski. Under Mark’s stewardship, Alemany Farms has gone on to produce 20,000 pounds of organic fruit and vegetables distributed to low-income families through community partners at the Free Farm Stand. In 2016, the farm hosted more than 100 field trips and corporate and faith-based groups, and through their weekly work and harvest days welcomed volunteers on 150 days of the year. “Food serves a way to connect people,” Mark says. While Mark is not involved in the daily operations of the farm anymore, he is still active in Alemany’s governance through Friends of Alemany Farm, a volunteer group that helps coordinates the food production, distribution, and educational programs. In 2015, Mark became the executive editor of Sierra Magazine, the flagship publication of the Sierra Club, the nation’s largest grassroots environmental group. Previously, Mark was editor of Earth Island Journal and a freelance journalist for a range of national magazines and websites including The New York Times, The Nation, The Atlantic, Civil Eats, and Gastronomica. Mark is also author of Satellites in the High Country: Searching for the Wild in the Age of Man (Island Press, 2015) and Insurrection: Citizen Challenges to Corporate Power (Routledge, 2003). Mark continues to keeps his hands dirty with a vegetable garden in his backyard.